Do you often find that you need to write an email, but just don’t have the time to do it? Or maybe you’re driving in the car and need to shoot a quick email to someone to let them know that you’re running a little late, but don’t want to take your eyes off the road to do it? If you often find yourself in situations such as these, then the Dragon Dictation appfor the iPhone is just the thing you need! Dragon Dictation iPhone app works very easily. When you first open the app, you’ll see a “Record” button. 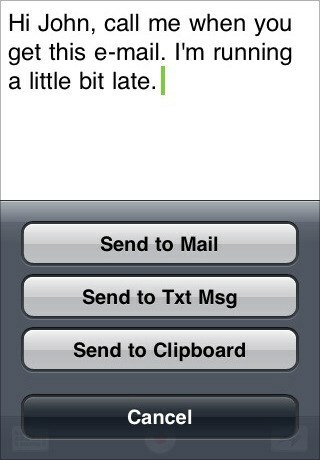 And tapping it is all you need to do to make sure that your important dictation gets typed. Some users have noticed that it takes a minute for the app to process it to text but it does it within just a few seconds and most users don’t notice a time delay at all. And, just as if you were typing on your computer, Dragon Dictation app for iPhone will give you a list of possible words that you might want to use and it will even do some quick editing for you if the app hasn’t gotten it quite right.